Educate Together National Schools are a specific type of state-funded primary school in Ireland. They are part of the National School system that was established in 1831 and which, together with the Special Schools, comprise all State-funded primary education in Ireland. All National Schools, whether Roman Catholic, Protestant, Islamic, Jewish or Educate Together schools are funded by the State on an equal basis. They operate the same National Curriculum, follow the same Rules for Boards of Management and are staffed by teachers who have the same level of professional qualifications and recognition. Under the Education Act, the Board of Management must undertake to run the school according to the ethos determined by the Patron. In addition, one half hour period of teaching per day for children in the school is reserved for the Patron’s exclusive religious curriculum. In the denominational schools that constitute the majority of National Schools in Ireland, the Patron is usually the Bishop of the religion concerned, but in an Educate Together National School, the Patron is a company limited by guarantee whose activities are regulated by its Memo and Articles and the Companies Acts and whose decisions are made at General Meetings of its members. This has created a modern, transparent and accountable model of patronage that is defined in clear legal terms. This very simple idea is the foundation of all policy and practice in the school, whether it is the enrolment policy, the way that the Board carries out its work, the way that a code of behaviour is developed or the manner in which the curriculum is delivered. It is important to note that these principles are not ‘mission statements’ or merely statements of aspiration or intent. They form real commitments to deliver an education that reflects these binding principles. The Board of Management of an Educate Together school must judge its performance against these core principals at all levels of school activity. It is worth considering these commitments in some detail. 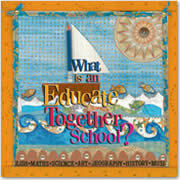 From its formation in the mid-1970s, Educate Together has defined this term to include all denominations of all faiths. Thus Educate Together schools are committed to the principle that all religious backgrounds should be equally respected in the operation of the school. Included in this definition are humanist, agnostic and atheistic viewpoints and a generic concept of ‘personal creed’. The term ‘respect’ is carefully chosen. There is a clear distinction made between the concept of accommodation or tolerance of difference and the concept of respect. Toleration and accommodation inherently imply that a majority view must make allowances for minority views and minorities must make requests to achieve this accommodation; respect implies care and equal treatment as of right. In practice, the objective of an Educate Together school is to create a school culture and practice in which the identity of every child is guaranteed active support. Neither the child nor parents or guardians should have to ask for that respect to be given. The school works hard to create a positive, comfortable atmosphere. The underlying concept is that human diversity enhances life, enriches cultures and provides huge educational resources for current and future generations. In an Educate Together school, the daily period of time set aside for the patron’s religious education programme is used to deliver our Ethical Education Curriculum. This programme is called the “Learn Together” curriculum and is published by Educate Together. It is subject to review and development by the Education Committee and decisions at Annual General Meetings of the organisation. A copy of the curriculum is available from the school or from Educate Together. The programme is divided into four strands ‘Moral and Spiritual Development’, ‘Justice and Equality’, ‘Belief Systems’ and ‘Ethics and the Environment’. The curriculum specifically addresses the Educate Together ethos and it is here that the values that the school seeks to model in its ‘characteristic spirit’ are articulated and explained in greater depth. In the strand called ‘Belief Systems’, the programme explains and explores the major belief systems in the world in an educational manner, teaching children about these faiths and beliefs without endorsing any particular one as religious truth. During the year, an Educate Together school may mark – in an age appropriate way – festivals such as Chinese New Year, Easter, Bealtaine, Hindu Festival of Lights (Diwali), Harvest Festivals, Samhain (Halloween), Ramadan and Eid, Hannuka and Christmas. The programme allows the school to explore the similarities and differences with the older celebrations that underlie many of these festivals. Examples would be the Celtic festivals and practices that underpin Easter or the solistice festivals that occur around Christmas. It is normal that the treatment of these events becomes integrated into the whole school programme, involving drama, art, music, history and geography and also in many cases, parental and community participation. This may mean exploring wider cultural themes such as cuisine and family celebrations. The range of such activities within an individual school will be determined by local conditions. In addition to offering the ethical education programme, Boards of Management of Educate Together schools enable any group of parents who wish to use the facilities of the school outside school hours to organise specific doctrinal instruction classes. In most Educate Together schools, for instance, Roman Catholic sacramental preparation is available in these out-of-hours programmes; these are organised by Roman Catholic parents often with the direct participation of the local parish. These classes mix naturally with other extra-curricular activities of the school. Parents of other faiths are similarly facilitated. It is important to note however, that the Board is not responsible for the establishment of such classes and is only involved in so far as to ensure that they are responsibly organised, covered by insurance and that the necessary steps have been taken to ensure the safety of the children attending. There is never any obligation placed on a child, parent or staff member to become involved in doctrinal instruction. When this model of school ethos is conscientiously implemented, no child is ever placed in a position in which they feel themselves an outsider in the school programme because of their family or individual identity. The approach minimises the situations in which parents or children feel the need to absent themselves from aspects of school life. It maximises the school’s ability to address the religious rights of all families without favour or discrimination. The human rights of teachers and other workers in the school are addressed, as staff are never placed in a position in which they may be required to put forward as religious truth a viewpoint that they may not themselves hold. Whilst Educate Together holds that this way of treating religious difference in an Irish school context offers many advantages, we appreciate that there are families for whom this model may not be suitable. For instance, an Educate Together school depends on parents who are happy to allow their children to explore and be exposed to different religious views and who do not regard it as their religious duty to seek to persuade others of their beliefs. In the case of families who observe strict guidelines around their children’s exposure to artwork, games or sports of other faiths, a denominational school of their conscience, or a recognised programme of home education may well be a more appropriate choice. If such options are not available in the locality, however, Educate Together schools will attempt to handle these questions as sensitively as possible. From an educational perspective, the inclusive nature of the Educate Together ethical programme permeates and influences all teaching in the school. The focus is on an explorative approach to learning that is managed and facilitated by the teacher. Children are encouraged to gain personal understandings in a creative and supportive learning environment. They are encouraged to evaluate information, form judgements and articulate these judgements in a supportive, respectful and safe environment. The child is formally recognised as a participant in the education process and a valued part of the learning organisation that is Educate Together. Participation in school affairs and listening to the voices of the children is part of the democracy that underpins the school. This core value of partnership aims to nurture a deep appreciation of the concepts of participation and rights in society, organisations and the world. The co-educational principle was included in the Educate Together Charter at a time when coeducational schools were in a minority. Today, this is no longer the case and the significance of this element of our charter has changed. It now obliges the Board of an Educate Together school to work to ensure that all children are empowered to fulfil their potential irrespective of gender. Co-educational education is far more than simply putting girls and boys into the same classroom and teaching them the same curriculum. Instead it should ensure that the school develops a comprehensive programme to counter gender stereotyping in all its forms. Schools should be proactive in promoting an approach to learning that encourages and supports the wide variety and range of talents among the children irrespective of gender. This is a complex issue that a school cannot solve on its own; nevertheless it must be addressed and discussed within schools in partnership with parents, teachers and students. The significance of this element of a school’s work should not be underestimated. The rebalancing of gender roles based on equality and respect is central to the growth and development of society and Educate Together is committed to ensuring that children are given every opportunity to explore and develop an equitable approach to gender. As a result of its place in Educate Together’s Charter, active encouragement of children of both sexes, and the combating of gender-based discrimination is an important part of the ‘school plan’ in an Educate Together school. The Curriculum of National Schools and the approach adopted in the training of National School teachers has been defined as “child-centred” for many years. However, the inclusion of this term in the Educate Together Charter as a founding principle means rather more than the definition of a teaching philosophy or the articulation of the national curriculum. It defines another element of the policy formation of an Educate Together school. It obliges its Board to take decisions primarily based on the broad educational and developmental needs of the children over and above other external factors. This for instance, would influence decisions on opening hours, school holidays, code of behaviour and allocation of funds. Many of these decisions involve striking a balance between conflicting obligations. Nevertheless, this aspect of Educate Together’s Charter ensures that the needs of the children of the school strongly influence the decision making process. It should be noted that we refer to the “children of the school”. A school is a collective organisation that strives to address the individual needs of every child. However, any school must balance these needs with the general interests of all the children. All Educate Together schools have been set up by volunteer groups of parents in a community. As patron body, Educate Together facilitates this process and empowers those involved by providing advice, training and support in negotiating with relevant organisations, including the Department of Education and Science. The key stakeholders in the process are the parents and supporters who tackle the difficult and complex task of establishing the school. As a result, parents have a vital role in the operation of the school and its ethos reflects this. High levels of parental involvement in the work of the school are encouraged. The Charter of Educate Together obliges the school’s Board to encourage and welcome this involvement whilst balancing it with an equal obligation to “positively affirm the professional role of the teacher”. Educate Together schools have been pioneers in the development of the concept of partnership between parents and teachers in the operation of schools. A critical element of this lies in the involvement of parents and guardians in the educational process itself. This is achieved through the provision of support for the teacher inside and outside the classroom and in providing educational activities that are not available to the school in the normal way. participation in educational support activities such as paired reading. serving on Boards of Management and other school committees. Once a school opens itself up to the participation of parents, guardians, grandparents and the community, it has access to a wide and rich range of resources that would be impossible to provide by funding alone. This is of great support to the teachers in the school and of immense educational benefit to the children. It requires skill and care to operate a primary school which respects the delicate balance between the intense individual commitment of parents to their child’s education and the professional, objective care and attention of highly qualified teaching professionals. Educate Together is committed to ensuring that schools nurture this partnership and provides training and support for school Boards in order to maximise the potential of this approach. The involvement of parents in partnership with the staff provide children with examples of practical community co-operation. This is a powerful support to the values articulated in the classroom. Children thrive in this atmosphere and are similarly inspired to work together in diverse settings in order to achieve common goals. This approach to education promotes the democratic involvement of children in the school. We have found that it is possible to operate effective Students’ Councils in primary schools and that it is vital to the success of codes of behaviour that children and parents directly participate in the drawing up of such policies. Once children have a safe space in which they can participate, assured of support of teachers and parents, they can influence the growth of many other school policies and have done so very successfully. In recent years, for instance, many school environmental policies have been successfully driven by children’s committees and have resulted in the awarding of Green Flags to many schools. This is a very brief overview of some of the key concepts involved in the Educate Together model of National School in Ireland. Educate Together does not claim any exclusive rights to these ideas. Many of them are implemented in other schools in Ireland and abroad and we fully endorse the efforts of dedicated educators operating in schools of different patronage. We do not see our future as an exclusive or niche provider in the Irish system. Rather we see the sector as part of a complementary development, providing choice where there has been no choice. We are committed to work with other providers to bring the structure of primary education into balance with the needs of our rapidly changing society and to address the human rights of children, parents and teachers. We hope that this booklet has been helpful in answering some of the questions about an Educate Together school and our aims as an educational charity. If you would like to know more, would like to enrol your child in an Educate Together school or help us with our work, further information is available from our website or from our national office. We look forward to meeting and working with many people and organisations to provide an educational system that is inclusive and respectful of all.